I know it’s April Fool’s day, but I promise you this is no joke. Like everything related to Dartz, the reality is far stranger than anything I can make up, anyway. Remember, these are the people who’s idea of luxury involves whale foreskins. 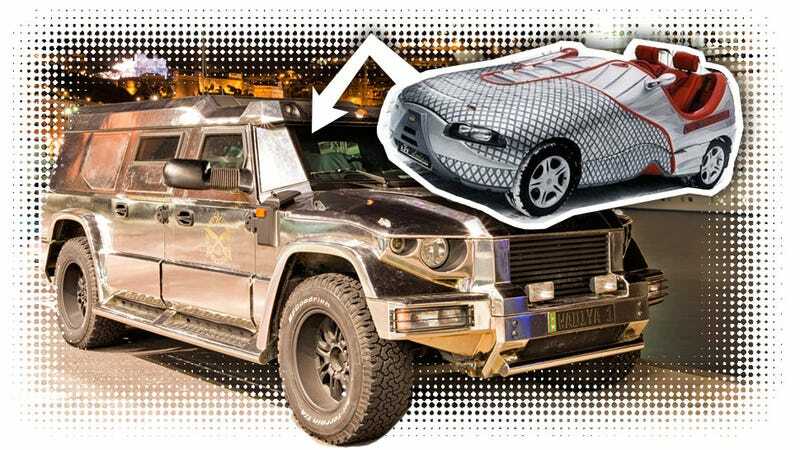 But once, long before making the worlds most unrestrained and opulent SUVs, they once made shoe cars. Leonard Yankelovich is the friendly madman who runs the show at Dartz, and occasionally he’ll message me with pictures of weird stuff, like this. If you’re wondering what sort of path one must go on to end up selling bulletproof baby seats and ultra-luxury war machines, the answer seems to be that you need to start by building drivable shoes. This particular shoemobile was made around 20 years ago for Reebok’s DMX line of athletic shoes. I sort of remember these silver ones, shoes that made you look like you jammed your feet into a pair of spaceships made by a tiny race of beings, who’ve now probably declared war on humanity, because you’re wearing their spaceships as shoes. The car is strikingly well done, all things considered, and is based on a Suzuki Swift. It’s not just some half-assed shoe shape; there’s a variety of textures going on there, there’s sculpted details for the laces and the ribbed rubber, and the cockpit is proportioned and padded almost just like the real sneaker. It’s easily one of the finest examples of the shoe-car known to mankind. It’s also interesting to note that, according to one of the world’s best auto design programs, at ArtCenter in Pasadena, the industry most likely to hire auto-design grads other than the automotive industry is the athletic/casual shoe industry. Nike, Reebok, New Balance – all these companies are full of almost-car designers. And, it makes sense – there’s something oddly similar about shoe and car design. Maybe it’s the similar proportions, or how both of them are required to pass strict emissions regulations. Anyway, I’m pretty sure there’s some lesson to be gleaned by the fact that the path to making gold-plated luxury beasts for Dictators (real and otherwise) starts by making a motorized shoe.